Aaron taught himself to read when he was three. At twelve, he created a user-generated encyclopedia, which he later likened to an early version of Wikipedia. He then turned his computer genius to political organizing, information sharing and online freedom. Aaron was on to making a better world for us all; a free world. In late 2010, Aaron Swartz downloaded a large number of academic journal articles through MIT’s computer network. At the time, Aaron was a research fellow at Harvard University, which provided him with an authorized account. Aaron’s motivation for downloading the articles was never fully determined. However, friends and colleagues reported that Aaron’s intention was either to publicly share them on the Internet or uncover corruption in the funding of climate change research. Faced with prosecutors being overzealous and a dysfunctional US criminal justice system, Aaron was charged with a maximum penalty of $1 million in fines and 35 years in prison, leading to a two-year legal battle with the US federal government that ended when Aaron took his own life on January 11, 2013. Aaron taught himself to read when he was three. At twelve, he created a user-generated encyclopedia, which he later likened to an early version of Wikipedia. He then turned his computer genius to political organizing, information sharing and online freedom. Aaron was on to making a better world for us all; a freer world. Five months before his death, Aaron completed Raw Nerve, a series of articles reflecting on life, depicting an honest, painful and yet beautiful picture of the tragedy of life. 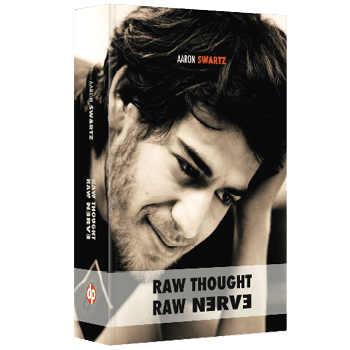 Focusing on his legacy, Raw Thought, Raw Nerve is a selection of Aaron’s best writings. I didn’t know who Aaron Swartz was. Then, in June 2014, I watched The Internet’s Own Boy: The Story of Aaron Swartz. Aaron taught himself to read when he was three. At twelve, he created Info Network, a user-generated encyclopedia, which he later likened to an early version of Wikipedia. Not long after, Aaron turned his computer genius to political organizing, information sharing and online freedom. In 2006, Aaron downloaded the Library of Congress’s complete bibliographic dataset. The library charged fees to access them. However, as a government document, it was not copyright-protected within the USA. By posting the data on OpenLibrary.org, Aaron made it freely available. Eventually, the Copyright Office sided in favor of Aaron. In late 2010, Aaron downloaded a large number of academic journal articles through MIT’s computer network. At the time, Aaron was a research fellow at Harvard University, which provided him with an authorized account. Aaron’s motivation for downloading the articles was never fully determined. However, friends and colleagues reported that his intention was either to publicly share them on the Internet or uncover corruption in the funding of climate change research. This time, faced with prosecutors being overzealous and a dysfunctional criminal justice system, Aaron was charged with a maximum penalty of $1 million in fines and 35 years in prison, leading to a two-year legal battle with the US federal government that ended when Aaron took his own life on January 11, 2013. Soon after Aaron’s death, director Brian Knappenberger, who was “inspired, infuriated and frustrated” by his suicide, began filming The Internet’s Own Boy: The Story of Aaron Swartz. After watching the end of the documentary, I was saddened by this tragic story and left with many questions: Why did the US criminal justice system take such a strong and unprecedented stand on punishing Aaron? Why did Aaron find no other way out than ending his life? What legacy did Aaron leave behind him? I discovered that between 2007 and 2011 Aaron read 614 books; one book every three days. Early on, Aaron made a point to write about his findings and reflection. From the “Hello World” post published on January 13, 2002 to the last known article written on November 1, 2012 “What Happens in The Dark Knight”, Aaron published 1,478 articles on his personal blog; one article every three days. Aaron dealt with a wide range of subjects going from politics, economics, science, sociology, through technology, education, nutrition, philosophy, among many others. But beyond that, I was struck by the clarity of Aaron’s mind on the difficulty of the subjects he was dealing with at such a young age. When the typical 16 year-old college student worries about fitting in and mating, Aaron was tackling with a book publication and wondered about what he should do with his life. At 18 he read Noam Chomsky, and at 23 wrote the very impressive 12,000-word piece “A Summary/Explanation of John Maynard Keynes’ General Theory”. This article was dealing with such complexity that two days after its publication, it was followed by a —much— shorter and accessible version, titled “Keynes, Explained Briefly”. After two months into Aaron’s writing, I was convinced that what Lawrence Lessig said at the MIT Media Lab talk “A remembrance of Aaron Swartz: A statement from Tim Berners-Lee read by Lawrence Lessig”, was indeed the best way to describe Aaron : he was not after the money; he was on to making a better world for us all; a freer world. […] It’s taken me two years to write about this experience, not without reason. One terrifying side effect of learning the world isn’t the way you think is that it leaves you all alone. And when you try to describe your new worldview to people, it either comes out sounding unsurprising (“yeah, sure, everyone knows the media’s got problems”) or like pure lunacy and people slowly back away. Ever since then, I’ve realized that I need to spend my life working to fix the shocking brokenness I’d discovered. And the best way to do that, I concluded, was to try to share what I’d discovered with others. I couldn’t just tell them it straight out, I knew, so I had to provide the hard evidence. So I started working on a book to do just that. Much has been written on the Internet about Aaron’s decision to end his life. The article “Losing Aaron”, written by Boston Magazine after interviewing Aaron’s father, Robert Swartz, gives a particularly precise and touching account of Aaron’s struggles during that time. [..] I was once one of those kids, working there, and I think about why I left [the university] and why I miss it. I marvel at the pointlessness, the impracticality, the waste. The sky is overcast now, the crowds of students have thinned out, and those that remain scurry from place to place with their heads down. I’m tired now, I feel sadder, and I wonder how I lost so much so quickly. I want to feel nostalgic, I want to feel like there’s this place, just a couple subway stops away, where everything will be alright. A better place, a place I should be in, a place I can go back to. But even just visiting it, the facts are plain. It doesn’t exist, it never has. I’m nostalgic for a place that never existed. There have been numerous criticisms about Aaron’s decision to end his life. Some agree with it, some don’t. Whether he made the right decision is certainly not for me to comment on. Instead, I’ve chosen to focus on the positive impact Aaron made on us all. This is why I decided to publish some of Aaron’s best writings in the form of this present book. While it has been allowed to post information about the documentary “Aaron Swartz: Internet’s Own Boy” on Aaron’s Wikipedia page, Discovery Publisher has not been allowed to do the equivalent with “Raw Thought, Raw Nerve: Inside the Mind of Aaron Swartz”; the link has been taken down several times with the excuse that Wikipedia does not allow advertising on their site. I understand that, but we’re not advertising about Aaron Swartz’s writings. The book is sold with relatively low margin on Amazon and at much lower price on Kindle and iBooks. A publisher has to pay for expenses related to a publication; that is a fact. The difference between “Aaron Swartz: Internet’s Own Boy” and “Raw Thought, Raw Nerve: Inside the Mind of Aaron Swartz” is that “Aaron Swartz: Internet’s Own Boy” was paid for before its publication whereas “Raw Thought, Raw Nerve: Inside the Mind of Aaron Swartz” is still to be paid for after its publication. So, why is Wikipedia doing that? Why is Big Media losing viewers? Fewer Representatives or More Monitors? Should our cognitive biases have moral weight? Do I have too much faith in science? What Does Blogspace Look Like? What Does Google Mean by ‘Evil’? What are the optimal biases to overcome? Download Raw Thought, Raw Nerve (PDF File). 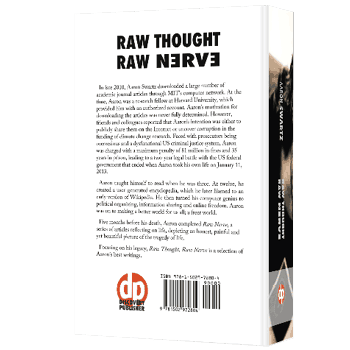 Download Raw Thought, Raw Nerve (ePub). -> While you’re here, take a minute to sign the petition to release Aaron’s IP under Creative Commons. -> While you’re here, take a minute to read/sign the open letter to Verso and The New Press, by Eileen A. Joy, punctum books’s Founding Director. Aaron Hillel Swartz (November 8, 1986 – January 11, 2013) was an American computer programmer, entrepreneur, writer, political organizer, and Internet hacktivist. He was involved in the development of the web feed format RSS and the Markdown publishing format, the organization Creative Commons, the website framework web.py, and the social news site Reddit, in which he became a partner after its merger with his company, Infogami. Swartz’s work also focused on civic awareness and activism. He helped launch the Progressive Change Campaign Committee in 2009 to learn more about effective online activism.